The bestselling Americano Thermal Mug is exclusively made here in the UK and is a massive success for promotional drink ware. The stylish and modern alternative to the standard take-out coffee cup has a 350ml capacity and is made from double-walled polypropylene material to keep drinks warm. The Americano Thermal Mug is a fantastic way to get your brand seen out and about, or even on desks. 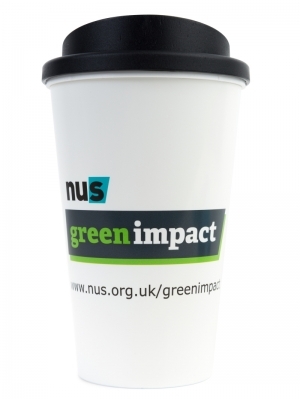 The hardwearing manufacture of this cup makes it virtually indestructible, ensuring your message will be around for a long time to come. Dishwasher safe, microwave safe, Food migration test, MSDS available. For items branded with your own design, with or without the Green Impact logo - minimum order quantity 480pcs. For orders over 1,000 pcs please contact us for a special rate.